Effectively justifying a new HR system or upgrading an existing one has always been something HR executives have had to contend with. But with the recent economic hard times combined with new, emerging technology platforms such as cloud computing, mobile computing and Software-as-a-Service, making a compelling business case for either venture has become even more critical-and challenging. In this white paper you will learn how to make the business case for a new HRIS to senior executives. 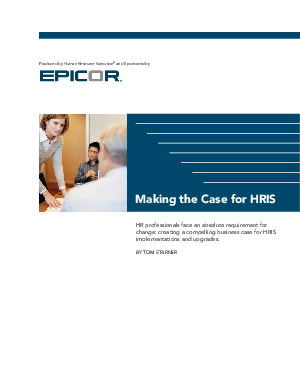 This white paper was written by Human Resource Executive for Epicor Software.